Today I successfully managed to trigger and sync my Roland Juno 6 arpeggiator with my Yamaha RS-7000 Sampler Workstation. AWESOME! It works beautifully and the timing is very tight and doesn’t have any problems at all. I sampled a positive pulse sound and loaded wav up with the Yamaha RS-7000. I then used the Sequencer to create a pattern of pulse beats. After that I connected a cord from the headphone jack of the RS7000 Sampler to the Trigger Sync Jack (In) of the Roland Juno 6. I turned on the Arpeggiator along with the hold button and presto …. the arpeggitaor was triggered flawlessly. You have to turn up the volume on the RS-7000 all the way too so that you get at or above the 5V mark. The Yamaha RS7000 Sampler is perfect for me because I can also sync with Midi and have any other drum machine, sampler, synth, etc. play in time with the Roland Juno 6. Sweet! You can also program different patterns among a few other things on the Yamaha RS-7000 so that you can get some really cool Arpeggiator arrangements for the Juno 6. After searching around the internet I could find very little if any information, so I was quite thrilled to find a solution so easily and quickly. Now I don’t have to waste money on a Roland TR-707 or TR-626 for simply triggering the Juno 6 or creating patterns. The RS-7000 does it all and more. Thus getting the Roland Juno 6 in sync with my other gear is now completely solved. Saving patches is the only minor glitch, but that is actually proving to not to be a big problem because I can pretty much program the sounds I need rather quickly anyway. It’s also fun to just be plain different whenever I do a song each time because it adds variety and I can come up with new fresh ideas. The Roland Juno 6 is a fantastic synth and for the price I paid $90 including manual and hard case, I really feel like I’m in Synth Heaven. Much fun indeed! 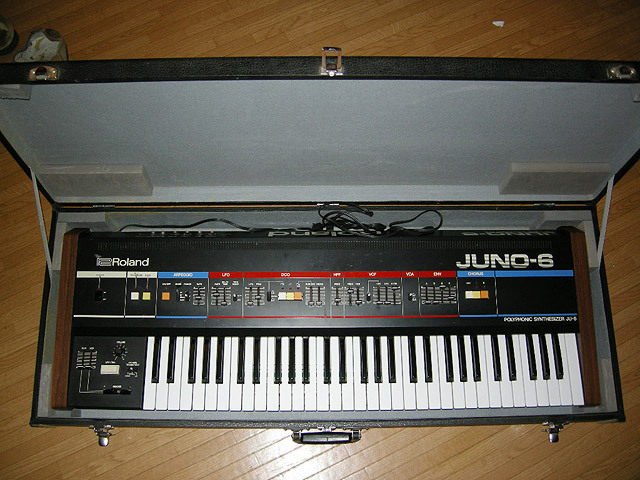 This week I picked up an excellent condition Roland Juno 6 for $90 bucks at a local second hand shop here in Nagano City, Japan. What a fantastic deal! The Juno 6 powered up just fine and absolutely everything worked like a charm. No problems at all! I also was able to get the case, manual, and some connection cords as well. I think somebody had this tucked away in their home for a long time and decided to sell it. I saw it sitting up on a shelf and instantly grabbed it to check out the condition. I brought some headphones and just rolled over at the price tag. I new then I was going home with a fantastic Roland Juno 6. The sound of the Juno 6 is awesome in my opinion and it’s been a blast jamming on it for the last couple of days. I find the Juno 6 to be so much more reliable and stable than the Juno 106. Which sounds better? I think they both sound great in their own way in case anyone asks. I love the LFO trigger on the Juno 6, plus the arpeggiator is awesome as well. In fact, in my next post I’ll explain how I got it to sync with my drum machines. 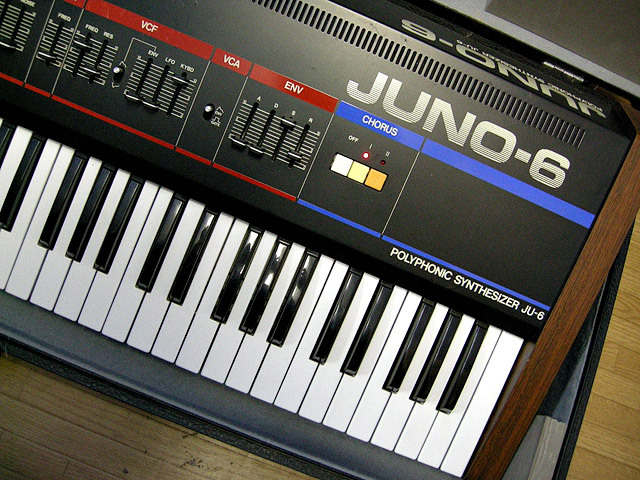 Indeed the Juno 6 does not have midi nor patch storage, but that is not a problem. I found a way to sync the arpeggiator and because I can play keyboards and program synths well, the patch storage is only a minor issue if at all. It’s definitely a fun machine. Cool video found on youtube.